Baltimore is a fabulous place to celebrate New Year's Eve, whether you prefer a lively night on the town, a romantic evening for two, or a laid-back celebration with the kids. Ring in 2019 in style with fireworks, live music and dancing, family-friendly events and more. Make your plans early as some celebrations require reservations. What better way to spend New Year's Eve than aboard a boat on the Chesapeake Bay? These cruises offer music, dancing and a prime view of the fireworks at the Baltimore Inner Harbor. Advance reservations are required. Spirit Cruises will cruise the harbor for the count-down to 2019 with a holiday buffet, open bar, champagne, live DJ entertainment, and incredible views of the fireworks. Must be 21 or older. Spirit also offers an early NYE dinner cruise and New Year's Day cruises on the harbor. NYE Live! At the Power Plant will keep you busy until the ball drops. This all-inclusive party billed as the Mid-Atlantic's biggest New Year's Eve event, includes 10 bars, food and drink, music, themed party favors, laser shows, dancing and a midnight showing of the Times Square Ball Drop on two 20 foot LED screens, confetti, and a balloon drop. For ages 21 and up. This year live music is from Doc Marten and The Flannels and Alter Ego in Angel's Rock Bar. DJs will keep you dancing on the Main Stage and Mosaic. The Power Plant complex is located next to the Inner Harbor, so guests will have convenient access to transportation, parking, restaurants, and hotels. Tickets are ​online. Also on the Inner Harbor, Big Night Baltimore at The Radisson Baltimore Inner Harbor, is an all-inclusive event with multiple party rooms, food and drink, bands, DJs, dancers, body painters, and a massive midnight celebration. Room discounts are available. 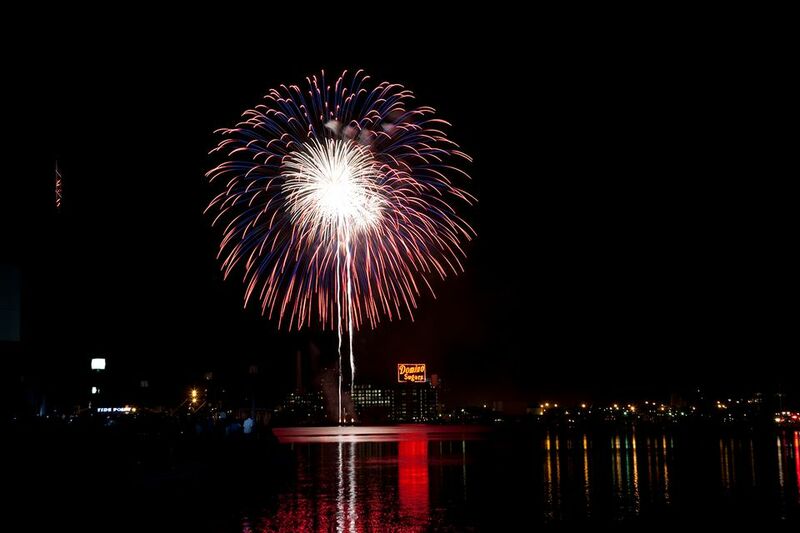 At Baltimore's Inner Harbor there will be fireworks at midnight with live entertainment from 9 p.m.-12:30 a.m. at the Inner Harbor Amphitheater. Ring in 2019 with family and friends watching the colorful fireworks filling the sky above downtown Baltimore. The event is free and the display can be seen from the surrounding area. Enjoy a late night dinner at one of the city's great restaurants and then head over to the harbor to watch the show. Celebrate in style and spend the night in town. Charm City Countdown at the Hilton BWI in Linthicum Heights invites you to dress as your favorite classic Hollywood star. They will "transport you to Hollywood, filled with the biggest stars dressed in their absolutely swankiest attire, and movie characters who walk Hollywood Boulevard at Midnight on New Year's Eve." Enjoy Vintage Hollywood decor, tasty food, modern drinks and classic favorites plus unique entertainment and great dance music. You can dress for the red carpet in elegant NYE cocktail attire or in your favorite movie costume. Multiple bars, 10 party zones, 12 bands, DJs and other entertainment. Balloon Drop at midnight. Howl at the Moon offers multiple packages. The high energy show is centered around dance hits and party anthems. New Year's Eve packages include options for seating or standing room, food, and open bar. This party is located in Power Plant Live! These events are family-focused with indoor activities specially designed for kids. At the Port Discovery Noontime New Year the children's museum counts down to the new year with performances and activities geared to ages 2-10. With three floors of hands-on experiences, this is a great way to spend the afternoon with the kids. Regular admission fees apply. Maryland Science Center Midnight Noon helps the kids ring in the new year by enjoying the ball drop before bedtime. Festivities include live music, dancing and arts, and crafts. The entire museum will be open. Regular admission fees apply. Head to Havre de Grace for the New Year’s Eve Duck Drop and Fireworks. The annual Havre de Grace Duck Drop and fireworks celebration are​ preceded by dancing outdoors to music by local DJ and then watch the Duck Drop at midnight. New Years Eve Murder Mystery Trains in Cumberland leave the station on December 31, 2018, for a New Year's Eve event. Guests will enjoy a show and a nice dinner (surf and turf, pasta primavera or pork chop) dinner aboard the Western Maryland Scenic Railroad. Plus, there will be a free Champagne Toast when the clock strikes midnight. On 34th Street between Chestnut St. and Keswick Rd. in Baltimore, there is a wonderful Christmas Street. For a more laid back New Year's Eve celebration, head to the Hampden neighborhood, see the Christmas light display and join the community's annual ball drop at midnight.